Gay Valentine’s Day | First Met, The Baby Question, Introducing the BF to the family and their Ideal Valentine’s Day. Valentine’s Day, or rather Singles Awareness Day, is upon us once again. Couples have celebrated together at events around the country, and probably have some extra special plans for their loved one. For many of us, though, Valentine’s Day is seen as a day to spread the love to everyone. As if there isn’t already a reason to push out the positive vibes to others, today is a perfect time to show them some love, and don’t forget to love yourself! We first met 8 years ago on Twitter! Remy spotted Travis in a picture one of his friends posted and decided to follow Travis, who then followed back. Some sarcastic banter for a year or so later, and we finally agreed to meet for a drink. We’ve been best friends ever since. We tend to not use Valentine’s Day as an opportunity to be romantic. Romance, for us, is best when it’s not expected and can happen all year round. We’d usually either go for a nice meal somewhere or watch a great movie – we love the cinema! Presents are never a big thing as we’d rather have a great experience somewhere with each other, but we’ll always write a soppy card and collect them so we have the memories to look back on. Remy: wow, that’s a hard one! It would have to be when Travis proposed to me. That’s pretty hard to beat!! We had the most perfect day with each other doing all the things we love. Travis: I was about to go on holiday for a week and decided to surprise Remy by taking him to one of his favourite restaurants. Once I asked him to be my boyfriend, he (adorably) had a small card inside his jacket pocket with the date and a simple yes written inside. Remy: We’re both really lucky that we have such amazing, open and loving families. Travis has so much charm and charisma it was an absolute breeze – although he did freak out when he got mud all over the fresh white bed linen my mum had prepared. Travis: Remy first met my parents when we came to Sydney for the first time 3 years ago – a quite intense way to meet parents but couldn’t be helped given the distance. We all spent three weeks together and traveled around Australia; with many late nights, laughs, lazy days in the sun and some slightly aggressive games of UNO haha! 4. Thoughts on traveling as a couple, has it changed/affected your travel plans? When it comes to holiday planning we’re really lucky that we like the same things: remote destinations with crystal waters, white sand and great cocktails. We certainly have a passion for exploring cities and cultures but the beach always takes preference. One thing we’ve certainly established together through our travels is a passion for business class – we can’t help it we just enjoy the travel so much more that way! Oh so many!! We want to do Safari in South Africa, relax in the lakes of Hawaii, Bora Bora, Mauritius, Seychelles. We spent our actual honeymoon in the Dominican Republic which was an absolute dream. But the Maldives is our number one target for the ultimate holiday together. 6. When it comes to “the baby question”. Do you want kids? Remy: I definitely want kids. I adore them and Trav will be THE BEST dad, ever. It’s always on the cards but right now we have so many experiences and projects to complete before we fully commit to children. Travis: absolutely, when the time is right. Living in Australia right now, with our niece and nephew, has reminded us both how much we want kids. Keeping the faith that it will happen one day, but right now we’re lucky to be able to enjoy quality time with the little ones that are already part of our family. Remy: hmmm as in physically or emotionally?! Let’s go both: again, SO HARD, but I massively love Trav’s height – enables him to give me the best hugs and make me feel super safe and loved (although means he takes up a lot of room in bed) and emotionally his optimistic and calm nature which completely balances mine. Travis: errrrm … how do I say this, his bum (lol). Ha, that and his ferocious loyalty to those he loves. We met in college, the first physical education class in September 2007, we measured each other’s pulse and heartbeat. A picnic together, lie on the grass and breeze leisurely. Marc: Make lovely cards for him by hand. Shane: I’m not good at cooking. On important festivals, I cook delicious food and enjoy it together. Marc: After 10 years of friendship, I formally introduced Shane to my family. They were all very enthusiastic about it. Shane: My mother was very quiet and had no special reaction. It felt like she had known it for a long time and I thought it was too late to say it. Traveling together is a wonderful way to increase each other’s happiness. Marc: It feels very sweet. It’s very happy to hold a child’s hand. Shane: That’s a great question because I’m looking forward to having my own children. Marc: @yummertime as they are very sunny and handsome couple, full of photos of nature, it is the life I yearn for very much. Shane: @pjandthomas as they share their lives, and they look very sweet. Marc: Lively, cheerful, optimistic, with a sunny smile. Shane: With attractive eyes, very long eyelashes, always looking at me with electricity, he is a good man who is serious and responsible. It’s a bit cliché but we met at Manchester pride in 2009. Two of our friends had been dating so ended up at the same party! Was definitely love at first sight and the rest is history! Sanj: My parents adore Doug and my mum and him get on really well. We love going travelling with our mum’s too. Doug: Sanj has fitted right into my family, he doesn’t have any brothers or sisters but now he has mine. Our mum’s get on well, they even went travelling together without us! We love travelling together and it’s our passion. We do think twice though to make sure that where we are going is LGBT friendly because safety is really important. You have to be more careful in some places. Bora Bora! We really want to get one of the amazing water bungalows there. That will be next year we will have our mini-moon in Santorini first. Sanj: I definitely want kids, we’re starting to think about it at the moment, It’s something I never thought I’d be able to do! Doug: Yeah we really want to start a family soon and raise kids in a loving happy home. We really like Justin and Nick (@justinickpgh) they just seem like a lot of fun, @dadsnotdaddies are so cute with their family and @explorerssauras_ have amazing travel photos! We met through our coming out videos on YouTube. Matthew posted his coming out video in May of 2013, and Michael posted his coming out video as a video response exactly one year later. Matthew watched Michael’s video, and instantly connected with Michael over Twitter. We Skyped that night, and within a week Michael has purchased his plane ticket to visit Matthew in Seattle. 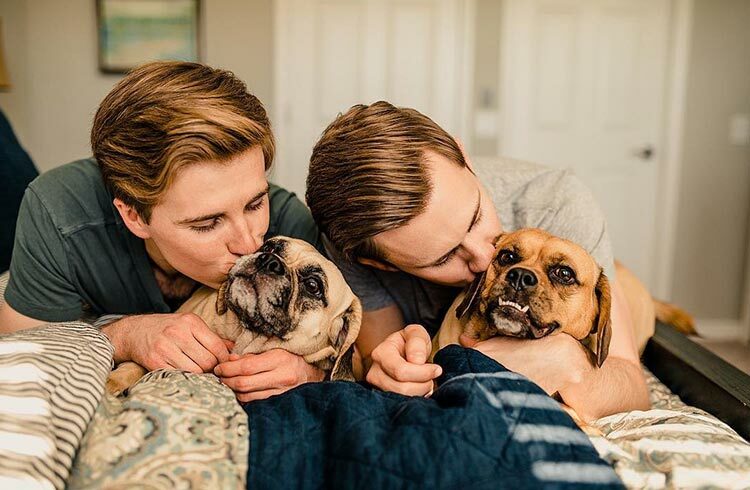 Things moved quickly, and after just a couple months of dating, Matthew decided to move across the country to Nebraska to be with Michael while he attended dental school. Michael: Just exist? Kidding. When I surprised him in New York City when Matthew was away for work in Peru for several months. He was flying back to NYC for a weekend convention, and I surprised him at the airport. He didn’t even know I was going to be there as I told him I had to stay home for dental school classes. Matthew: I surprised Michael with tickets to Europe on Valentine’s Day. What’s funny, is that he used the trip to propose to me by surprise! Michael: It seemed pretty natural. I just kind of felt at home right away. It was a little quick after meeting, but it wasn’t awkward. It just felt right. Matthew: I introduced Michael to my entire family just a few days after we first met. I was on my way home from graduating college. He met me in my hometown as a surprise and came with me to my graduation party the same day where he met my entire family. It was strange because no one had even heard of him and I was there introducing him as my boyfriend. But, it felt comfortable and it just seemed right, like matter of fact – this is Michael, he’s my boyfriend and I’m happy he’s here with me. It has absolutely changed how we both travel. We love traveling together, there is no better way to go about seeing the world! However, when we are traveling together, we must compromise so many things from activities to food to where we are staying… even what class-fare to buy in airplane tickets, haha. Matthew is a much more backpacking-type traveler. He loves staying in hostels and really roughing it whenever given the option. Michael loves the comfort and luxury of nice hotels, easing into a more relaxing but possibly more expensive style of travel. Together, Michael ensures that Matthew actually has fun and is able to relax on a trip, and Matthew helps Michael get a little off the beaten path and experience things not often sought after by the everyday tourist. We honeymooned in Thailand and honestly, we wouldn’t pick anything else! Where we hope to go next for a trip is New Zealand. That’s way up on our list. We would love to see the mountains there, hike, and see Hobbit-ton of course! Michael: Yes absolutely! I want to have a minimum of two kids. I would love to buy a house first. I have no preference on gender, but we are looking into adoption! Matthew: 100% yes. I want to have 2 or 3 kids, but not for a few years. Michael and I would like to have a house first and allow our lives to stabilize a bit since we have just moved across the country and gotten married. We would absolutely love to adopt, and perhaps look into surrogacy in the future. Michael: @justincblomgren and @harperbf because they make San Francisco look incredibly pretty and it makes me want to visit. Matthew: I absolutely love @pjandthomas What they post is so matter-of-fact, and true to form of an actual every-day-life kind of couple. I love that their photos aren’t extravagant, and I love that they just show themselves doing life together – something I can truly relate to. Michael: Matthew is always very adventurous and brings me opportunities to experience new things that I would never experience if it wasn’t for him. He makes life one big adventure that I love to be a part of. Matthew: Michael is nearly always joyous and brings attention to the things that really matter in life. He’s level headed. He’s cool, calm and collective. Okay that’s a lot of things, but I feel like it encompasses a bit of his entire character. His character is what stands out. together with a delicious bottle of red, preferably at home cooking together. Restaurants tend to be overpriced and overloaded at this time of the year… We were thinking a lot about this question. Maybe we don’t find an answer as we are so long together already, and we are doing little surprises to each other regularly. But the most emotional moment, and where we both cried a little bit, was the moment when we stuck the ring on each other’s finger and got married. F: Our first introduction to our families was always connected to too much alcohol. culture. This has brought us to reschedule our travel speed quite a bit. be fair against the child. M: We will get a dog one day when we settle in one location. hope to meet them one day in real. fond of them. They are very cute together. M: His ears. I love to sleep next to him and smell his ears. We met on Instagram in January of 2014. When Instagram Messenger first came into existence, I messaged Grant thinking he lived in California. After a short conversation, we both realized that we lived on opposite ends of the country (Grant in Florida and Nick in California). Within a week, we bought a plane ticket for Grant to fly out to Santa Barbara, California. That Is where we met, in person, for the very first time. I was sitting outside of the Airport and Grant walked out, suitcase in hand, and our adventure began. Our ideal Valentines Day would be a dinner at home with our dogs. We are pretty simple homebodies and would prefer to avoid the crowds. The night would start with some Italian food (Spaghetti or Pizza; Most likely Pizza) and a nice bottle of wine. Following dinner, cooked by Nick since Grant can not even prepare toast, we would get in comfy clothes and cuddle on the couch with our two babies, Alvin and Theodore. Our night would conclude with a movie, most likely a romantic comedy to keep the spirit of Valentine’s Day alive. On Nick’s birthday one year, I surprised him with a trip to the Ritz Carlton in Palm Springs, California. He had no idea where we were going until we were about halfway there. Nick to Grant’s Family: My family accepted Nick fast, but also slow. Since I moved to California right after they met him, they got time to evaluate our relationship before spending a lot of time together. Nick was the first guy I had ever introduced them to so they were a little curious at first. Once they got to know him and once we moved to Florida, they are now closer than ever. Grant to Nick’s Family: My family accepted Grant slowly. They were always nice, but my parents always thought I would be with a blonde haired beautiful woman, which turned out to be a blonde haired beautiful man. Their first interaction with Grant was after a plane ride home from what we supposed to by my Spring Break Trip to Florida, which turned into, “Hey my boyfriend is coming back with me and moving into my Apartment.” After a couple of years, they slowly started to accept Grant as an important figure in my life. It took a lot of time and patience on both ends, but they now have a great relationship with one another. Traveling as a couple has been easier than traveling alone. It gives you a companion to eliminate a lot of the worries and stress that comes with traveling alone. We typically pack one large bag together and share clothes throughout the trip (it’s really nice being the same size in most clothes). We are living out our dream Honeymoon Destinations this May. We will be traveling to Paris, France and Dublin, Ireland which are two places that have been on our bucket lists for years. If we could add one place that we will have to save for later, it would be Greece. We both agree on the topic of kids. We both want 2 kids and we both want a boy and a girl. Grant and I both feel like we will go through surrogacy to have our children, but we may be open to adopting at a later date. Our favorite couples are the same. @Chapteroftwo is inspiring for many reasons. They were one of the first couples that we met when coming to Instagram and they have been nothing but supportive the entire time. Their love for one another is apparent and their kindness is something that we strive for in our everyday lives. @burganandbrine are another couple that stands out to us. They have an amazing family, which is something that we strive to have someday. The experiences they share are ones that we hope to have with a family of our own one day. Nick for Grant: My favorite part about Grant is that he is naive about a lot of things. So many things are new to him and he is constantly asking questions, which is extremely endearing. It makes me feel like I am an important figure in his life and that I am always there to help. Grant for Nick: My favorite thing about Nick is when I look into his eyes, I feel safe and he gives me this feeling of comfort and security. I forget about everything else and with one look from him, he makes me feel whole. We met 7 years ago in the first week of January 2012. Filip has just joined the gym where Jan was frequently doing his workouts. We were totally checking each other out from the moment we saw each other but never when the other one was looking. So neither of us had noticed that. We said hi, started talking, and Jan invited Filip to work out together some time and help him with his training. We started working out early mornings before work for a while, without even knowing that we were both gay. Working out and talking a lot lead to a lot of texting, e-mailing and eventually a dinner – under the pretense of drafting a new workout schedule. And this was still without being sure whether the other one was actually gay or not! We never discussed that. But shortly after, following a second dinner, one thing leads to another and the question about being gay or not was undeniably answered. We have been together ever since. We love travelling as much as we can. So our ideal Valentine’s Day is just being together on a trip, exploring new places, being impressed by new views and enjoying each other’s company. Filip: Jan would always leave small post-its for me wherever he could – in the fridge, in my car, in my wallet, in my coat, behind the bathroom mirror, on the door know – with loving messages and hugs. Jan: Filip is continually cute. I love how he always holds me every night when we go to sleep. We never fall asleep without. And when we are away from each other because of work Filip will text me before going to bed and tell me he’s holding me even when I’m not next to him. Jan first met Filip’s sister when we were not very open about our relationship yet. But of course she knew what was going on and it was all fine. It wasn’t until quite a bit later that Jan met other members of Filip’s family. I was relaxed and fine from the very beginning and we have already been abroad sometimes together with them. Jan’s parents literally welcomed Filip into the family the moment they heard we were no longer just friends but boyfriends. The same counted for Jan’s brother, sister-in-law and niece and nephew. They all said they saw it coming or knew there was something between us before we did! We already both loved travelling before we met. But yes, things have changed. Filip has become the organizer of almost all of our trips. He is amazing at finding great but cheap ways to travel and places to stay in. Thanks to Filip’s know-how we have been able to travel even more than we ever did before without spending more money. We also love meeting people wherever we go. And as a couple, we have made many new friends thanks to Instagram and travelling together. We love the paradise photos we sometimes see on Instagram from the Maldives. We have never been there and it’s a very expensive destination. But it sure looks like a dream place to go to! Filip only wants kids when they come with an OFF button and Jan is fine with that. So no, we don’t want kids ourselves. But we do really enjoy having kids around when friends who are parents come visit us. We love hanging out with kids and playing together. But we are happy to be free to travel whenever we want and do whatever we want without the responsibility of being parents. This is very easy. We both love Rob and Devon, who are @dadsnotdaddies on Instagram. We started following them years ago before they became instafamous. Jan became emotional the first time he saw their account because of how open they were and how loving and happy their family vibe is. They were one of the reasons we started a couple account. They inspired us to become more open about his sexuality too. We have been in touch with them ever since we started following each other and met in real life too. This is pretty difficult to answer since we like a lot about each other. And the answer could be very gay if we spelled it all out. Maybe we can just say we like many parts of each other?